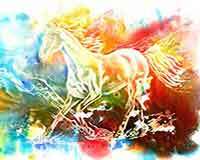 Glazing with watercolor, it is often called laying down a wash.
Wash a layer of transparent color over a previous dry layer of paint. The viewer sees both layers of paint and their eye visually mixes the color. 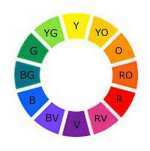 Glazing produces more luminous colors than when the colors are mixed on the palette. 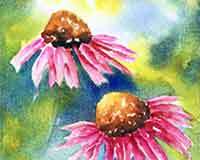 Glazing may be used with any type of paint, oil, acrylic and watercolor. Many oil paintings are painted alla prima. The colors are premixed on the palette and then applied to the painting in one layer. 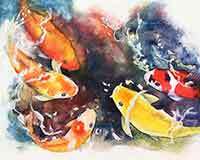 The same method can be used with watercolors. Premix the colors on the palette and paint them in one application. Glazing however applies the paint in several applications. We will glaze step-by-step with several separate layers of paint. 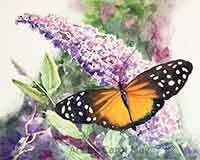 We will be glazing with Winsor & Newton professional watercolors. Whatever brand you use make sure the colors are transparent or at least semi-transparent. Glazing won't work well with opaque colors. 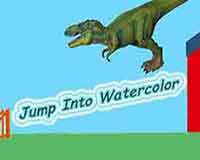 Using a soft flat watercolor brush wet the area you will be working on. Paint the lower mango with the cool yellow, Lemon Yellow. This mango is behind and farther back than the top mango. The cool yellow sets it farther back in the painting. Paint the top mango with the warm yellow, New Gamboge. Let these colors dry thoroughly. Using a hair dryer makes it faster. The initial wash must be completely dry, so when you apply more colors, they will not mix together. Clean your brush of any paint from the previous layer before adding a new layer of paint. Make a wash of the Winsor Red and water. Winsor Red is a transparent color. If you don't have Winsor Red, use Permanent Rose which is a transparent color. 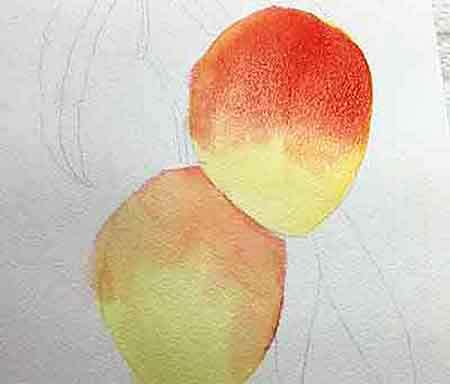 The Cadmium colors are opaque and do not work well for glazing. Let each layer dry thoroughly before you add another glaze layer. When the underlying colors are thoroughly dry, add the next glaze. This time we use Ultramarine Blue. Ultramarine Blue has the characteristic of granulating when it is applied. Ultramarine works for this application instead of other blues because of the granulating characteristic. 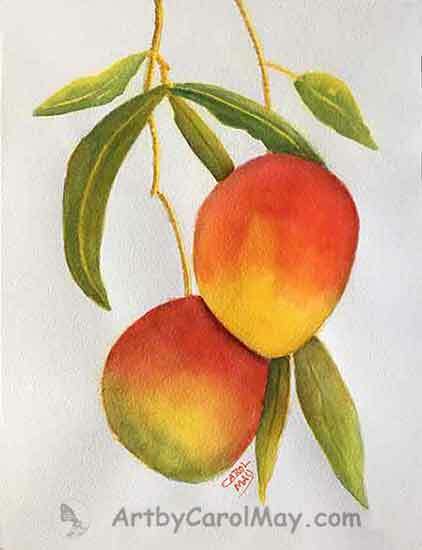 The granulation portrays the color variation and texture of the mango. The glaze of blue makes green. Use the same blue where the top mango overlaps the bottom mango. Apply a line of blue with a round brush. Immediately come back with some clear water to feather in the bottom edge of the shadow. Also, softly apply some blue around the outside edge of the mango. 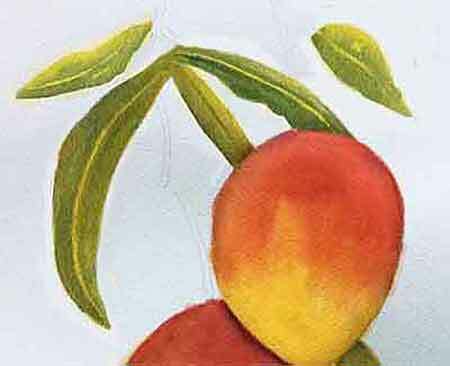 This makes the mango edge turn away from the viewer and gives it a rounded appearance. 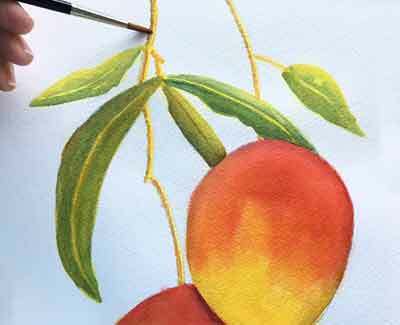 Continue glazing with watercolor on both mangoes. It took more than one glaze of the red to achieve the mango color. Glazing with watercolor takes multiple layers. The viewer's eye sees down thru the multiple transparent layers. 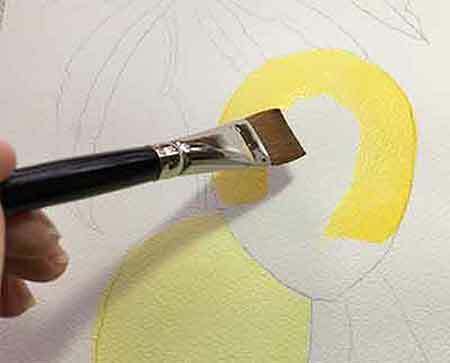 Add more glazes of yellow to intensify the color. 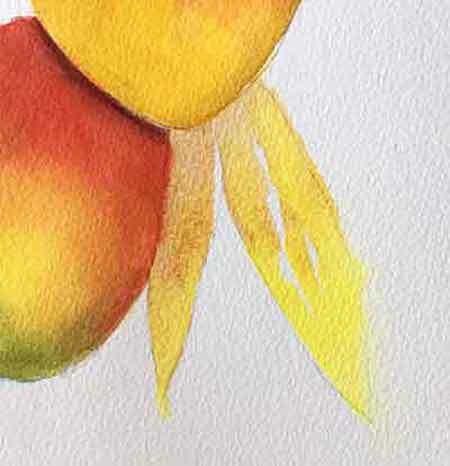 Continue to use the warm yellow on the top mango. The cool yellow on the bottom mango will set it behind the top mango. Continue glazing until you are satisfied with their color. Do the lower leaves first because they are set behind the fruit. Paint the leaves with yellow. 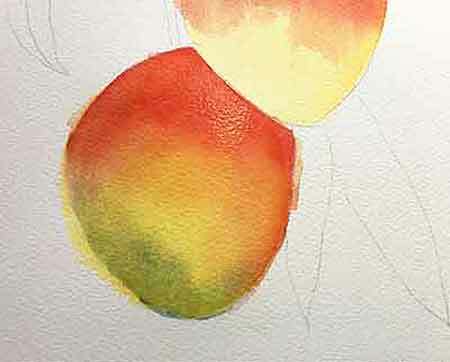 We used Raw Sienna close to the fruit for the shadow area and Lemon Yellow farther away from the fruit. Raw Sienna made an earthy colored leaf. If you want a cleaner green use Lemon Yellow all the way. Leave some paper white for interest. After the yellow is dry glaze on some blue to make the leaves green. If you used Lemon Yellow for the entire leaf, then darken the shadow area with extra blue. Do the lower leaves first. Paint the leaves with yellow, let it dry. Glaze on blue to create green leaves. Your may paint outside of the leaf area. While the paint is still wet, blot it up with a tissue or a paper towel. If the paint is already dry, use a wet brush to dampen it. Then lift it off with your tissue. 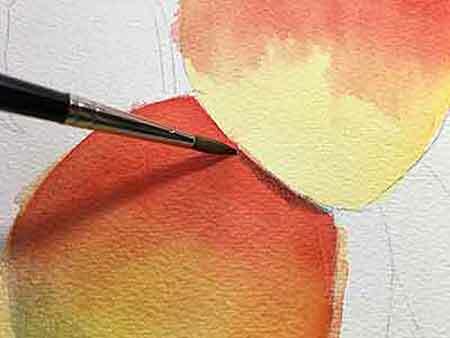 Glazing with watercolor requires extra time while you are waiting for the layers to dry. 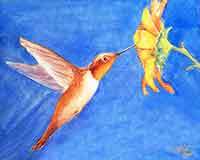 There is a freedom when one color is painted directly into another moist color. It is pure joy watching the beauty of the way the colors flow and blend together while the colors are moist. Paint the stems with New Gamboge. 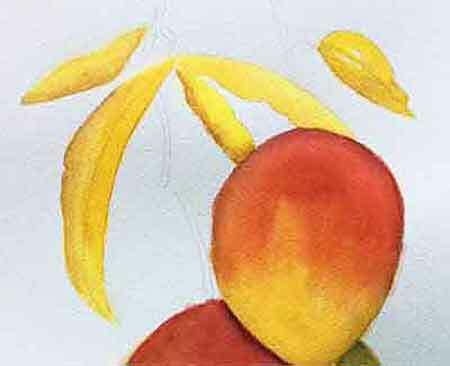 While the yellow is still moist, add a bit of Raw Sienna on the shadow side of the stems. Add Raw Sienna on one side. Paint blue in some areas on the shadow side of the stems. The colors blend together. 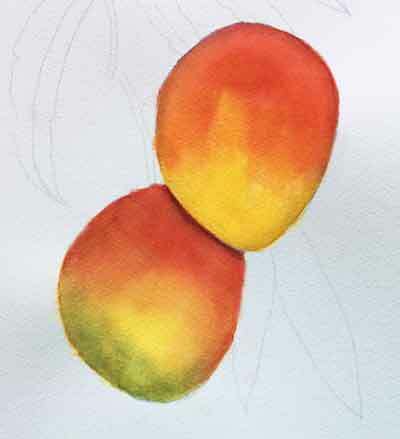 now paint your own mangoes! 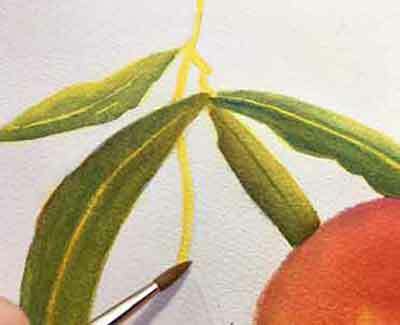 Glazing with watercolor is easy. The only hard part is waiting for the layers to dry. And a hair dryer speeds up the process. Now I get to eat my mangoes. Yippee!